This was a case of bugs sharing the spotlight with pigs, polar bears and pigeons. 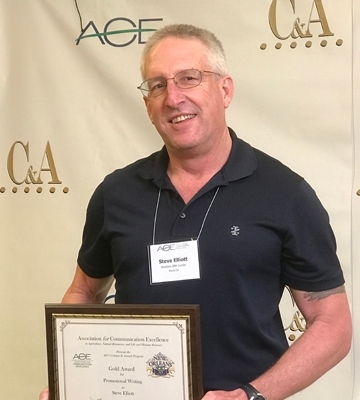 Six communicators affiliated with the University of California, Davis, or the University of California Division of Agriculture and Natural Resources (UC ANR) received a total of 10 awards for excellence at the 2018 conference of the international Association for Communication Excellence in Agriculture, Natural Resources and Life and Human Sciences (ACE), held in Scottsdale, Ariz. They brought home five gold or first-place awards: three silver or second-place awards; and two bronze or third-place awards. “That was quite a haul!” commented an ACE member on Facebook. And me--bugs. 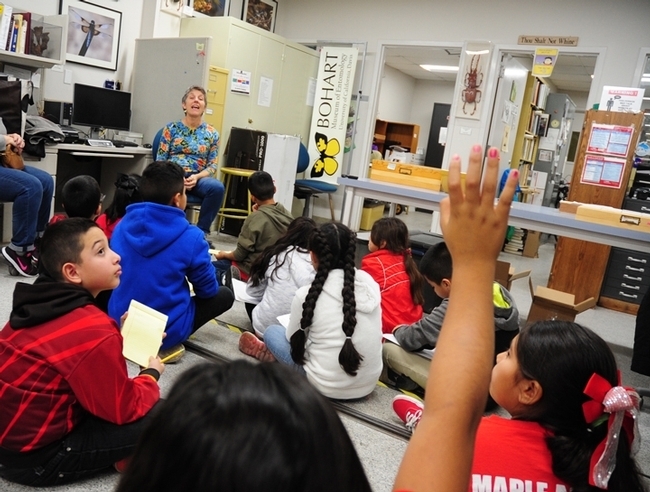 The news story that won the gold (by yours truly) involved a visit to the Bohart Museum of Entomology by children of California migratory workers. 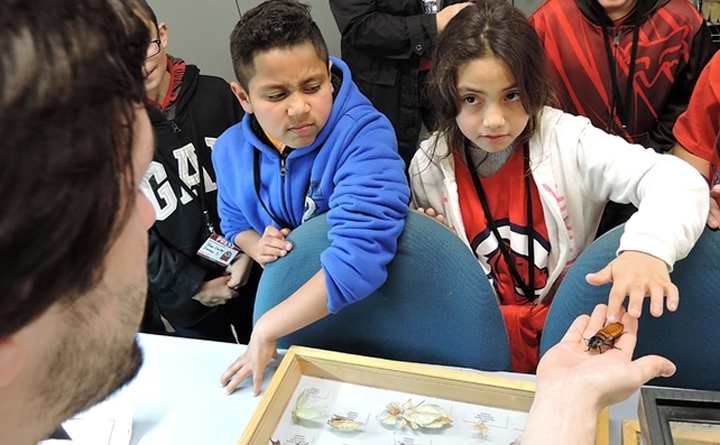 The piece, “Why These Youngsters Want to Become Entomologists” (https://bit.ly/2sYwhye) covered the children's tour of the insect museum, which houses some eight million insect specimens, a live "petting zoo" (Madagascar hissing cockroaches, walking sticks, tarantulas and praying mantids), and a year around-gift shop. The students engaged the director, Lynn Kimsey, professor of entomology at UC Davis, in a press conference. They asked the "who, what, when, where and how come" questions like pros. It was delightful to see them so well prepared and perceptive. 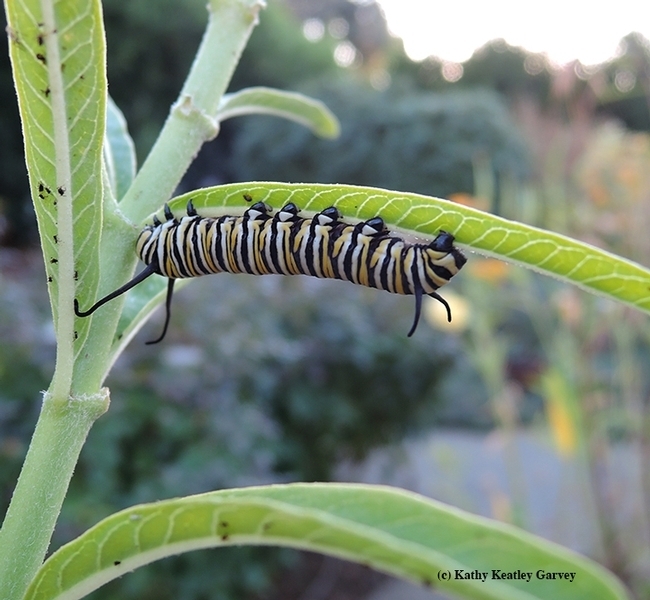 The Bug Squad blog that won silver (https://bit.ly/2BrePU5) involved a late-season monarch caterpillar that we found Oct. 27, 2017 on one of our milkweeds in our pollinator garden in Vacaville. It formed a chrysalis on Nov. 4. On Day 19, Nov. 22 (the day before Thanksgiving), it happened. The monarch eclosed. A big, strong and healthy girl. What to do...no way could she fly three hours in the rain and cold from Vacaville to an overwintering site in Santa Cruz. And with predators abounding, survival looked bleak. 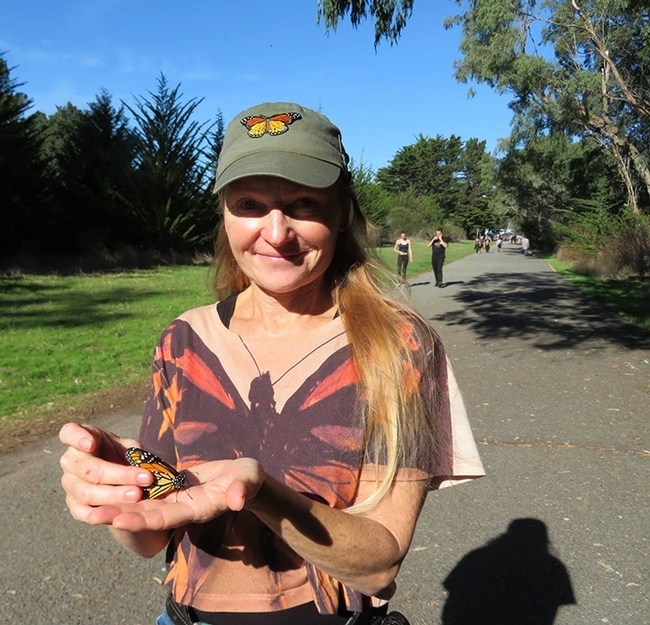 "It just so happened that a friend and pollinator advocate, Rita LeRoy, the self-described 'farm keeper' at the Vallejo City Unified School District's Loma Vista Farm, was heading to Santa Cruz on Friday, the day after Thanksgiving, to show her out-of-town relatives the overwintering migratory butterfly sanctuary at the Natural Bridges State Beach Park. That's about a 100-mile trip from Vallejo. "Could Ms. Monarch hitch a ride? "She could. And she did." 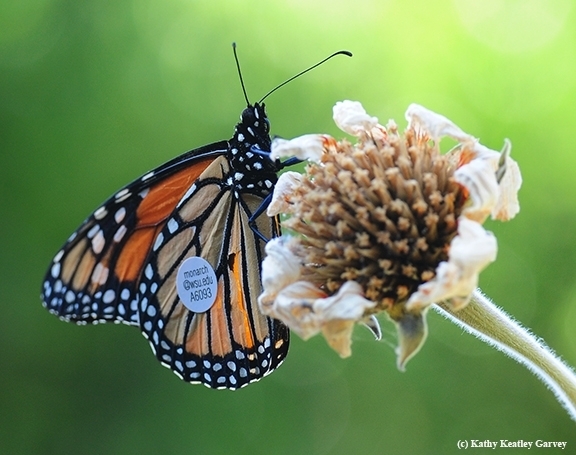 Rita is a Monarch Mom (she rears and releases monarchs) and is active in the Bay Area-Based Pollinator Posse. She teaches Vallejo City Unified School District youngsters about farming, cooking and gardening. And that includes gardening for butterflies. So Ms. Vacaville Monarch hitched a ride with Rita and her family. "She flew so fast that we didn't get a picture of her flying away," Rita related. "She was anxious to join her new friends." And hopefully, Ms. Vacaville Monarch provided the butterfly world with another generation. Two communicators based at the University of California, Davis, and affiliated with the UC Agriculture and Natural Resources, won a total of five awards for their writing and photography in a competition sponsored by the international Association for Communication Excellence in Agriculture, Natural Resources, and Life and Human Sciences (ACE). The awards were presented at the ACE meeting, held June 13-16 in New Orleans. Steve Elliott, communication coordinator for the Western Integrated Pest Management Center, received a gold award (first place) promotional writing for his story, "Safflower Makes an Areawide IPM Program Work. published in the newsletter, Western Front. Judges scored his work 100 out of a possible 100. They wrote: "You had me at Rodney Dangerfield. Very creative, the lead drew me right in wanting to read more. Excellent flow, packed with information in a narrative style. Congratulations on the terrific analytics for the newsletter." He also received a bronze (third place) for his photo essay, "Loving the Land of Enchantment." Judges wrote: "
Good variety of shot sizes which keeps it interesting. Diversity of stories along with photo content is engaging, and sticking to the IPM theme helps. There is so too much text info that it was difficult wade through. The words compliment the photos instead of the usual where the story supersedes the photos." A silver award (second place) for a photo series entitled the "Predator and the Pest: What's for Dinner?" on her Bug Squad post on the UC Agriculture and Natural Resources website on Oct. 3, 2016. Her series showed a praying mantis eating a cabbage white butterfly. Judges commented" "Definitely tell a story, interesting angles and good macro technique. Caught in the moment, but has a still life feel to it, like it's a diorama in a museum and we get to look at the scene from all sides. A unique look and good capture. A bronze award (third place) for her feature photo, "Save the Monarchs," posted Aug. 8, 2016 on her Bug Squad blog. 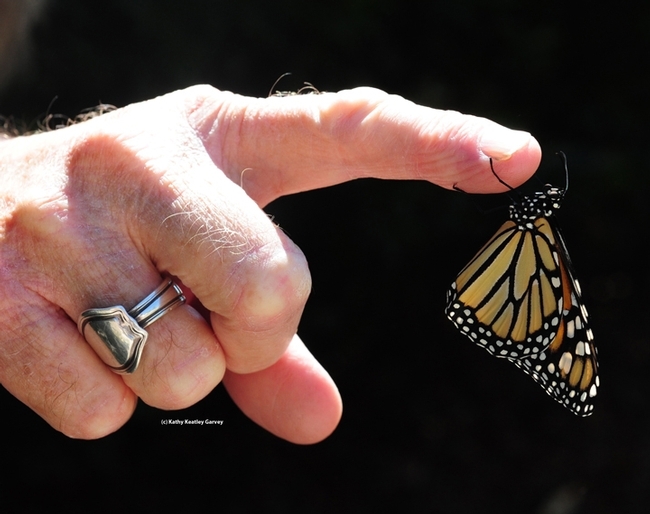 It showed a monarch clinging to a finger. Judges commented "The detail in this photo is incredible. The lighting on the hand against the black background is definitely striking. And it makes the white spots on the monarch pop! Beautiful!" ·A bronze award (third place) for blog writing on her Bug Squad blog posted Sept. 6 and entitled "A WSU-Tagged Monarch: What a Traveler!" Judges wrote: "Short and sweet and to the point. Perfect for web reading. The photo is so helpful to the reader. The call to action at the end is a plus and not something I've seen on other entries. Fabulous use of social media to extend the reach of the article, too. The Western Integrated Pest Management Center is funded by the USDA's National Institute of Food and Agriculture to promote the development, adoption and evaluation of integrated pest management, a safer way to manage pests. The Western IPM Center works to create a healthier West with fewer pests. It is located in the UC ANR Building in Davis. The UC Davis Department of Entomology and Nematology, headquartered in Briggs Hall, is affiliated with the College of Agricultural and Environmental Sciences and the UC Agriculture and Natural Resources (UC ANR). The department is globally ranked No. 7 in the world.